← Featured Brand: BIO TECH™ Pharmacal, Inc.
Can Your Unique Microflora Influence Your Diet Choices? 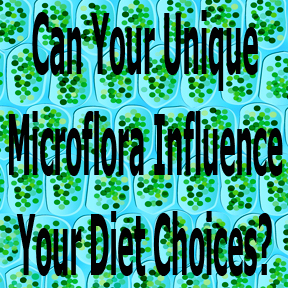 Posted on August 27, 2014 | Comments Off on Can Your Unique Microflora Influence Your Diet Choices? When we are watching our waistlines, most of us would like to believe we have the willpower to make healthy food choices. Although we are aware of healthy food options, we often err on the side of the less healthy choices. Afterwards, we may blame a lack of willpower and resolve to make better choices next time. But is lack of willpower the real culprit sabotaging our eating patterns? A new scientific review suggests that our gut bacteria may be influencing our food choices. Apparently, some of those sneaky little microorganisms can be quite manipulative. The secret to a healthy gut is a balanced microbiome and, according to Carlo Maley, PhD, director of the Center for Evolution and Cancer at the University of California, some of our microbiota are aligned with our dietary goals and some are not. The human gut microbiome contains tens of trillions of microorganisms containing more than a thousand different species, which collectively contain more than 100 times as many genes as the body does. Bacterial DNA control many bodily tasks including proper digestion, immune and intestinal function, energy metabolism and vitamin production. Of these trillions of microbiota, about one third are common to most people, leaving two thirds specific to each person, similar to fingerprints. Each person’s unique microflora begins at birth, continues to evolve throughout life, and is largely determined by our diet and our environment. How do our gut bacteria influence our choices? According to the study authored by Maley and Athena Aktipis, PhD and published in the Journal BioEssays, microbes may be under pressure to manipulate eating patterns in order to increase their own fitness. The study found certain microorganisms may generate cravings for foods that supply the sustenance for their specific need or foods that suppress their competitors. Another strategy may be inducing dysbiosis, a loss of the normal balance of microflora, which is linked to obesity, diabetes, inflammation, allergies or functional bowel disorders. The study concluded that microbes exhibit influence on reward and satiety pathways, our taste receptors and mood altering chemical production. Ideally, the ratio of beneficial to pathogenic bacteria should be approximately 85% helpful to 15% harmful. The constant ingestion of unhealthy food options can keep microbiome balance skewed in the wrong direction for optimal health. Fortunately, we can influence our beneficial colonies by reseeding our gut with probiotics and by eating fermented foods. Your diet can alter the composition of gut flora and have a significant impact on your health when you avoid low nutrient foods, chemical additives and sugar. Having a healthy microbiome profoundly and positively influences the activity of hundreds of genes that fight disease and maintain health. Eat a fiber rich, whole food diet with lots of vegetables, beans, nuts, and fruits, which feed the beneficial bacteria. Limit sugar and chemically laden processed foods which cause inflammation and feed unhealthy bacteria. Take probiotics daily to reestablish healthy microflora, which improve digestive health and reduce inflammation. Take antibiotics only when absolutely necessary and avoid acid blockers and OTC anti-inflammatory medications, which negatively impact good bacteria. FloraMend Prime Probiotic (SF811) by Thorne Research provides an allergy free, proprietary blend of 3 essential strains of vital probiotics to help replenish intestinal flora and promote overall and digestive health. Stomach acid resistant capsule ensures delivery throughout the intestinal tract. Stable at room temperature – no refrigeration needed. Non-GMO and gluten, soy and dairy free. Probiotic HPSS by Metabolic Maintenance supplies 60 billion CFU per capsule of high potency, shelf stable probiotics to support digestive and immune health. Targeted release, acid resistant capsule helps to maximize bioavailability. Gluten, dairy and soy free. Strengtia™ (K-61) by Apex Energetics targets and supports the intestinal environment with a specially developed scientific formula. Stomach acid resistant pre and probiotic formula contains selected strains that remain viable at room temperature. Ther-Biotic Complete by Klaire Labs offers a high potency, hypoallergenic blend of 12 certified probiotics for broad-spectrum coverage to support a healthy balance of microflora across the entire intestinal tract. This unique combination of colonizing and transient strains is formulated with a full spectrum of synergistic and complementary species. Heat sensitive – refrigerate to maintain potency. Gluten, soy, dairy, and yeast free. Ther-Biotic Children’s Chewable by Klaire Labs provides a broad-spectrum, hypoallergenic probiotic supplement designed specifically for children aged 2 and older. Naturally flavored chewable tablets benefit gastrointestinal, immune and oral health. Gluten, soy, dairy and yeast free. Refrigerate to maintain potency. This entry was posted in Home and tagged FloraMend Prime Probiotic (SF811) by Thorne Research, her-Biotic Complete by Klaire Labs, Microflora, Probiotic HPSS by Metabolic Maintenance, Strengtia™ (K-61) by Apex Energetics, Ther-Biotic Children's Chewable by Klaire Labs. Bookmark the permalink.